Personal condolences may be directed to the families we serve at gieseke@wiktel.com. Welcome to the official website of Gieseke Funeral Chapel. Our motto is "Dedicated To Service." Our goal is to help each family honor the life of their loved one with service offering dignity, integrity and respect...allowing family and friends to come together to remember, to honor, to support each other and to celebrate a life that has been lived. We offer each family we serve the opportunity to commemorate their loved one through the sharing of thoughts, feelings and memories. Through each celebration of life, families are able to reflect on the growth, commitments, achievements and the passing of the seasons in the lives of their beloved. 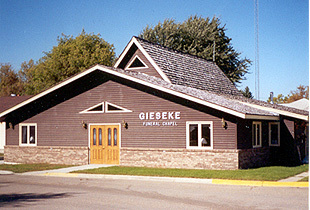 Gieseke Funeral Chapel's facilities are located on Main Street of Greenbush, Minnesota. It is owned and operated by Ernie Gieseke, CFSP. Gieseke's is a full service funeral home providing complete funeral services for all religious faiths. We can conduct services and visitations in other towns and facilities outside of our area. We offer traditional ground burial or cremation service. We can assist with pre-arranged funerals and we also offer sales and services of granite and bronze monuments and markers, as well as cemetery vases. Gieseke Funeral Chapel is a member of the National Funeral Directors Association and the Minnesota Funeral Directors Association, the North Dakota Funeral Directors Association, the Arrowhead Funeral Directors Association, The American Society of Embalmers, as well as many other professional and local service clubs and organizations. Click the "Have a Talk of a Lifetime" logo above, to go to a website with great suggestions about communicating important issues with those you care about the most. As a public service we offer free information by mail at anyone's request. Available are several different information brochures which will be sent at no cost or obligation. In the front foyer of our Funeral Chapel, there are over 60 different free consumer/educational type brochures and folders. Stop in anytime and help yourself to whatever you find interesting. We also have a library of materials and books to borrow locally. "The Funeral" Helps confirm the reality and finality of death. Provides a climate for mourning and the expression of grief. Allows the sorrows of one to become the sorrows of many. Is one of the few times love is given and not expected in return. Is a vehicle for the community to pay its respects. Encourages the affirmation of religious faith. Is a declaration that a life that has been lived as well as a sociological statement that a death has occurred." ---The Funeral from Ancient Egypt to Present Day America.